There are plenty of reasons to want a small pickup: lack of space, no need for massive towing power, and concerns about fuel efficiency are among them. While some truck drivers want a behemoth that can tow 10,000 lbs. of lumber in a trailer, there are plenty of us who just don’t need anything that big. If you are interested in a small pickup with plenty of power and great luxury features packed into its slight frame, then check out the 2019 GMC Canyon. Full disclosure upfront, the GMC Canyon doesn’t do everything and isn’t the right fit for everyone. Obviously, if you’re looking for a big, heavy-duty truck and want to have a ton of hauling power, then this is not the right choice. What the Canyon can deliver, however, is a great level of power for a small-size pickup truck and if you’re like me, you’ll see more and more to appreciate about the Canyon as you learn about it. While there are a lot of reasons to give the 2019 GMC Canyon a chance, here are the five that really struck me. I like choices when it comes to just about every feature on a truck, and so I’m quite happy with the fact that GMC offers three different engines on the Canyon. The standard engine for the 2019 GMC Canyon is a 2.5L 4-cylinder engine that provides up to 200hp and 191 lb.-ft. of torque. Now, I’ll be the first to admit that’s certainly not a ton of power, but remember this is a small pickup. If you’re not planning on doing a lot of towing, then this may be all you need, and you can pick up this build for a very reasonable price. If you do want more power, however, then there are two options available – though they are restricted to certain configurations and trim levels, so keep that in mind. The first possible upgrade to the engine is a 3.6L V6 engine that offers up to 308hp and 275 lb.-ft. of torque. So yeah, that’s a pretty serious upgrade from the standard engine. That’s more than 100 additional horsepower and almost 100 more lb.-ft. of torque – so this engine can definitely get a lot of work done and is a great choice if you need to be able to tow some weight behind you. Finally, there is a third engine available, which doesn’t offer much in the way of horsepower, but has a ton of torque. The 2.8L Duramax Turbo-Diesel 4-cylinder engine can give you up to 181hp and 369 lb.-ft. of torque. As I said, that’s actually less horsepower than what you get in the standard engine, but that torque! If you need that extra muscle for hauling loads or getting uphill, then this is a great choice. Ultimately, the beauty of these three options is that they let you decide what you need most, and then pick the right engine. Now, we both know that if you need to pull a lot of weight behind you or want a truck you can load up with 3,000 lbs. in the bed, then something like the 2019 GMC Canyon is not the right choice. This is a mid-size pickup after all, and even though it can definitely hold its own, you can’t compare this with something like a heavy-duty truck. That being said, it still delivers an impressive amount of towing capacity and work power for just about any job. 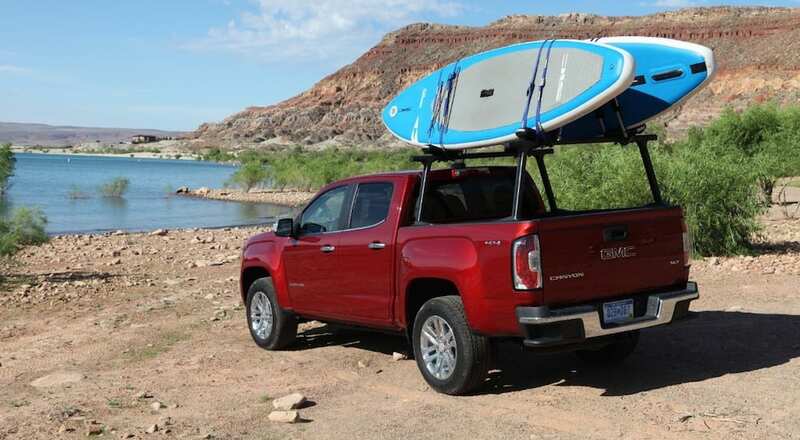 With the right build and towing options, the 2019 GMC Canyon has a maximum towing capacity of up to 7,700 lbs. That’s actually much better than I would expect from this pickup, and it really is a testament to the fact that GMC knows even mid-size truck owners still want to be able to get stuff done. The maximum payload in the back of the truck depends on what configuration you go with: with an extended cab and long box, you can load up to 1,384 lbs. into the bed; while a crew cab can carry 1,383-1,605 lbs. depending on if you go with a short or long bed. 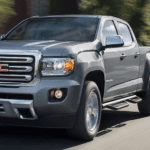 Trucks aren’t particularly well known for impressive fuel efficiency, but the smaller size and engine options for the 2019 GMC Canyon actually give it some pretty solid gas mileage. Keep in mind this varies based on the engine you choose, and with three engines available your potential fuel efficiency can vary quite a bit. So we’ll look at what kind of estimated gas mileage you can expect to get with each engine – and remember available engines vary based on the configuration and trim level you are interested in. The standard 2.5L 4-cylinder engine gets an estimated 20mpg in the city and 26mpg on the highway, which is pretty good for a truck. If you go with the available 3.6L V6 engine, you gain more horsepower, but lose some fuel efficiency. It gets an estimated 18mpg in the city and 25mpg on the highway. Finally, there is the available 2.8L Duramax Turbo-Diesel engine, which gets you an estimated 20mpg in the city and 30mpg on the highway – very impressive for any vehicle let alone a pickup! There are six different trim levels available on the 2019 GMC Canyon – technically GMC offers seven, but two of them are the same with different interior fabric options. I won’t go into a ton of detail on each of them, but let’s look at what you get from the standard, middle-range, and high-end options available. This will give us a pretty good sense of what’s on offer overall. The starting trim level is the Canyon SL, which features a 7-inch Infotainment system, a 6-speaker audio system, and vinyl seats. There are several USB ports available, a basic front center console, and power windows and door locks. The Canyon SL also features a 3-inch monochromatic driver information screen and a manually adjustable rearview mirror. If you step that up to the 2019 GMC Canyon SLE, then you get an 8-inch Infotainment system, the same 6-speaker audio system, and cloth seats. There are additional USB ports, a leather-wrapped steering wheel, and remote keyless entry. The SLE features single-zone climate control, a 4-inch color driver information screen, and an auto-dimming rearview mirror. For the ultimate level of luxury, then you can choose the 2019 GMC Canyon Denali, which features an 8-inch Infotainment system with Navigation, a 7-speaker Bose premium audio system, and leather-appointed seats. There’s a wireless charging station, heated driver and front passenger seats, and a heated leather-wrapped steering wheel. The Denali also includes remote start, automatic climate control, and a 4-inch color driver information screen. For me, nothing is more important than how well a vehicle can keep me and my friends and family safe when we’re on the road. Fortunately, there is a robust suite of safety features available for the 2019 GMC Canyon. Some of these are only included at certain trim levels, however, so keep that in mind. Safety features on the Canyon include StabiliTrak with stability and traction control, multiple airbags, and available rear park assist. There’s an available HD rear vision camera, lane departure warning, and forward collision alert. The Canyon even has a Teen Driver system, that enables certain safety features when a selected driver is behind the wheel and helps with teaching a new driver safe habits.